With full-color tags and new recipes, these books are guaranteed to be just as pleasing as our best-selling Classic Editions have been for years. Create homemade gifts to delight your family and friends! 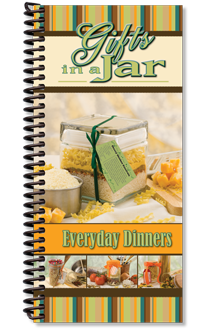 Recipes in Everyday Dinners include: Cajun Rice Casserole, New Orleans Quick Dinner, Skillet Lasagna, Tomato & Mushroom Pasta Bake, and many more!